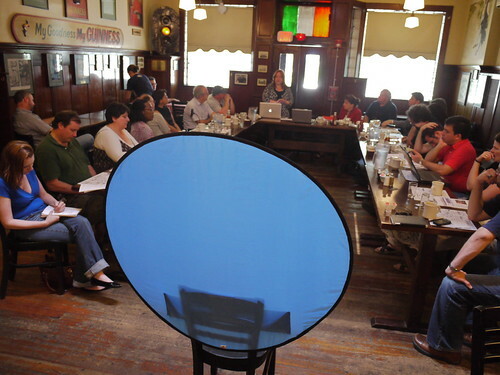 Boston Media Makers meet the 1st Sunday of each month at Doyle’s Cafe in Jamaica Plain, join us. This month I brought in some twitter t-shirts and backpacks from the 140 Conference I went to in NYC and this Web Around webcam background. Looks cool in the photo. Meeting Photos: Flickr Photo Set. Meeting Photos Mashed Up: Animoto Video Mashup. Here are some tweets from the meeting. 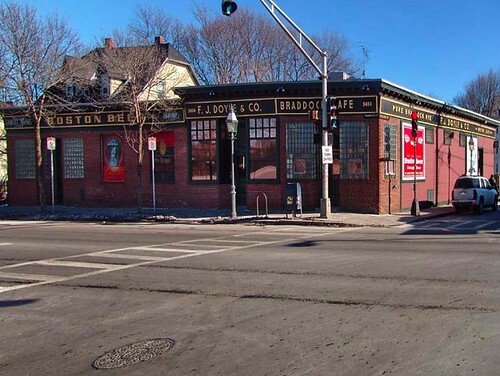 Click here to see a 360 degree view of January’s Boston Media Makers meeting by Jay Groccia. Watch in High Quality on YouTube. LIVE Twitter: We go around the table and talk about what we are doing, ask questions, present a show and tell. All within a 3 minute time limit. It’s fun. Bring something to share with the group. Something you’ve learned, something new you’ve found, or some good news. 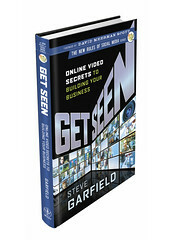 If you are interested in the web, social media, advertising, PR, audio, video, photography, acting… come by. See you at our next meeting on August 2, 2009. It’s usually on the first Sunday at 10:00 AM. Sign up for our mailing list on the right hand sidebar for meeting announcements.